MDI all chrome 345mm centres trail shocks with adjustable preload & bushes to suit your bike. 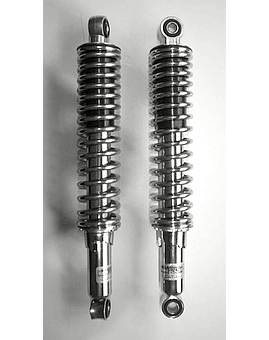 MDI 400mm trail shocks with chrome dampers. Choice of chrome or red springs. Adjustable preload & bushes to suit your bike. £79/pr. Betor MX Shocks. Progressive springs, mount either way up. 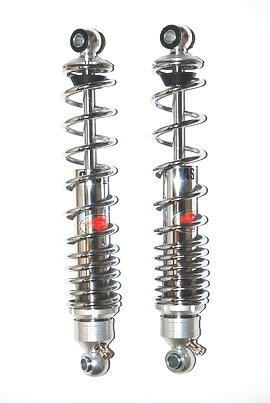 360mm twin spring shocks for Bultaco Frontera & Pursang. And then there are Alloy Pro's, the latest version of the old favourite. The steel bodies are chromed, and fitted with aluminium end pieces to save weight - only 200 grams saved, but it all counts!!. Redesigned internally as well, they are excellent. Plus the preload adjustment is now via threaded body rather than circlip, and the lower bushes are semi-conical to allow more freedom of movement. 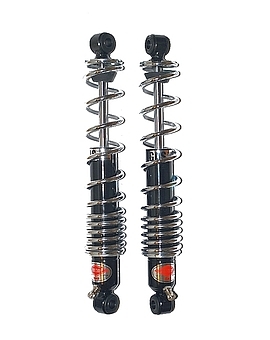 Available in 320mm, 340mm, 350mm, 360mm, 380mm & 400mm length with a choice of 40lb, 50lb or 65lb starting spring rates, although the springs are progressive and end up at around 80/90lb. They have the same long 105mm travel and 12mm rod. Bushes are fitted with 12mm steel sleeves. We can supply steel inserts to reduce the hole size to 10 or 8mm. Weight is around 2.3kg the pair. They can be fitted upside down if required. And if you want the best, take a look at these PRO-ELITE trials shocks. They have the same style and finish of the Alloy Pro's, and the same 35mm od dampers, but with two important changes which make all the difference. First, they have ADJUSTABLE DAMPING - via 20 clicks of the slotted screw set into the top mounting - enabling you to find the setup that perfectly suits your weight and the terrain, and vary it for different conditions. Second, instead of the 12mm rod that's standard on the Steel and Alloy Pro shocks, these Pro-Elite lovelies have a beefed up 14mm rod fitted for extra strength and positional stability. 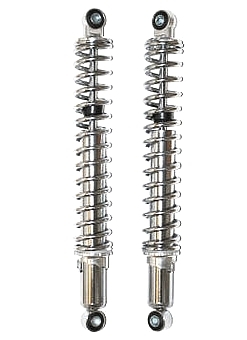 Available in 340mm, 360mm and 400mm length with the usual choice of 40lb, 50lb or 65lb starting rate springs. Also now available at 300mm long, but only with 65lb springs. Not cheap but the good stuff never is. Sizes: 340, 360, & 400mm. Spring rates: 40lb, 50lb or 65lb. Pro-Elites add adjustable damping. Sizes: 300, 340, 360 & 400mm. 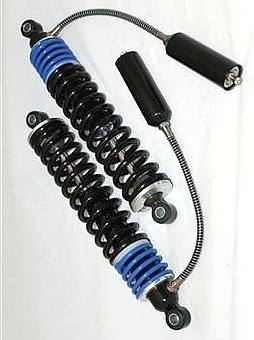 The Betor Steel and Alloy Pro shocks are rebuildable - If you've worn them out then this repair kit might be for you. It's a straightforward screw-in replacement for either, and comprises replacement 12mm damper rod, together with seals, damping control valve/discs etc. It fits 340mm and 360mm shocks steel and Alloy Pro, but not Pro-Elites as they take 14mm rods. 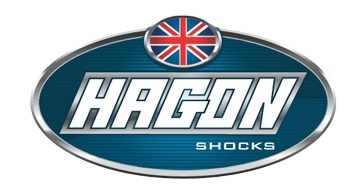 Hagon Trail Shocks - Twin spring shocks for off-road bikes with longer shocks. Lengths 370/390/420mm. 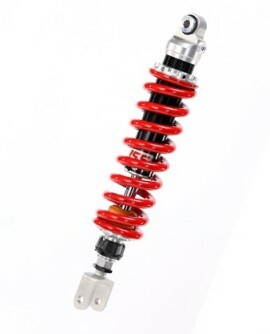 YSS MZ366 - Well made monoshocks with adjustable damping, preload & length. 36mm piston with 16mm shaft for strength. £233 each. 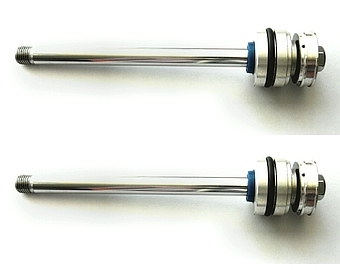 Progressive 13-series - Choice of lengths and spring rates. Supplied with bush pack to fit most bikes. Mount either way up. £279/pr. 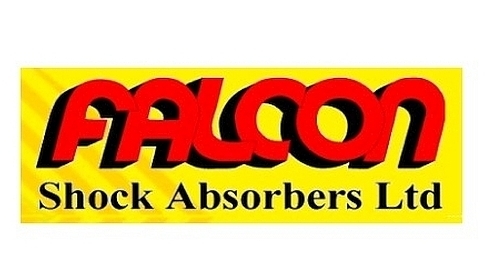 Falcon are a UK company who've been building off-road shocks for serious competition use, and exporting them worldwide, since 1977. 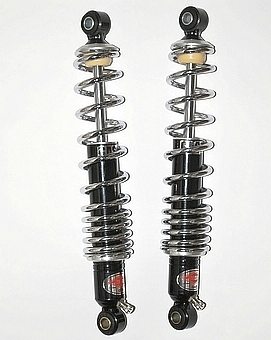 Shock absorber lengths, spring rates and damping characteristics are tailor made to suit bike and rider weight. 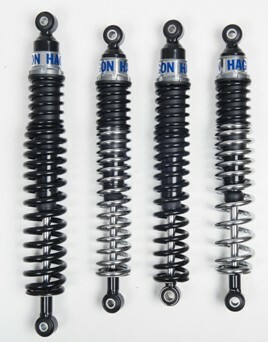 Shocks made for trials, pre-65 and pre-75 motocross, and post-75 twinshock/ evolution motocross. Made in a variety of styles, from steel bodies with integral reservoirs to aluminium bodies with piggybacks, in a wide range of lengths and spring rates, with 32mm and 36mm bore options. 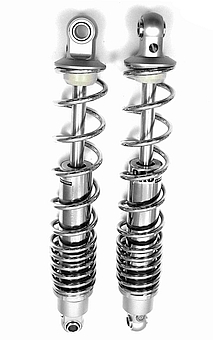 Most shocks are happy running either way up, and incorporate circlip preload adjustment. 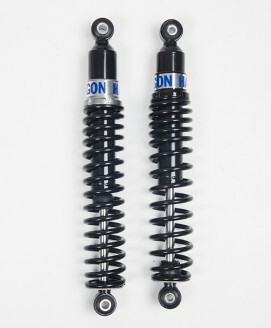 Prices for Falcon shocks start at £220/pair delivered for steel MX shocks. 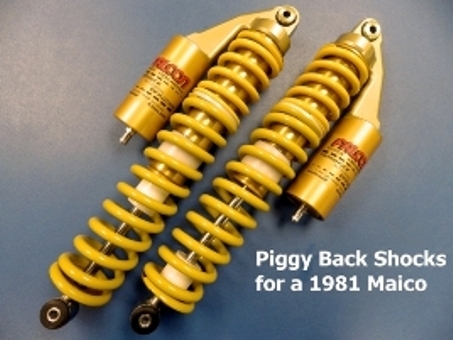 Shown as an example are aluminium piggyback shocks for 1981 Maico MX, costing £690/pair or £870/pair incorporating rebound damping. 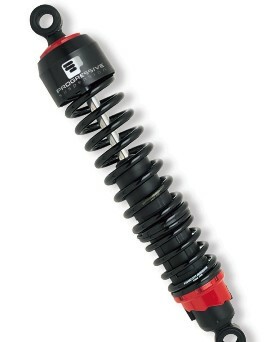 Wilbers Ecoline shocks are excellent quality and can also be the cheapest shock available for some bikes, like the 540-series shock for Honda's XL250R (MD11 frame) pictured here, which has a 46mm damper, stepless preload, progressive shim-stack damping control, and spherical bushes.. Made to order to suit rider weight, very substantial and well made shocks. Delivery 2 to 3 weeks.